Thanks are to the God of West Papuans for His blessings that make everything possible for every individual and every party all around the world including Freedom Flotilla activists for seeing the real situation and condition in West Papua that is so devastating. Hence, every West Papua support group always is the voice to voice out the devastating situation in West Papua in their own ways. Therefore, on behalf of the people of Federated Republic of West Papua, I would like to express my gratitude to every individual but especially to the people of Aborigine in Australia. 5. The people of the Federated Republic of West Papua wish for the Freedom Flotilla activists to urge every organizations and individuals that has been campaigning for the issue of West Papua in the overseas to form a forum of the mentioned issue. 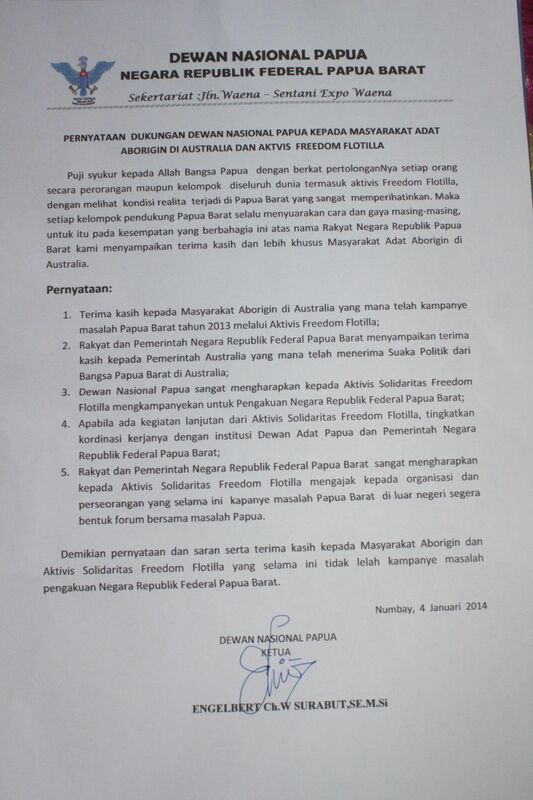 Thus, this is our statement, inputs as well as gratitude towards the people of the Aborigine and the Freedom Flotilla activists that has been working tirelessly in campaigning the recognition of the Federated Republic of West Papua.